Jan. 8, 2013: In the galactic scheme of things, the Sun is a remarkably constant star. While some stars exhibit dramatic pulsations, wildly yo-yoing in size and brightness, and sometimes even exploding, the luminosity of our own sun varies a measly 0.1% over the course of the 11-year solar cycle. There is, however, a dawning realization among researchers that even these apparently tiny variations can have a significant effect on terrestrial climate. A new report issued by the National Research Council (NRC), "The Effects of Solar Variability on Earth's Climate," lays out some of the surprisingly complex ways that solar activity can make itself felt on our planet. Understanding the sun-climate connection requires a breadth of expertise in fields such as plasma physics, solar activity, atmospheric chemistry and fluid dynamics, energetic particle physics, and even terrestrial history. No single researcher has the full range of knowledge required to solve the problem. To make progress, the NRC had to assemble dozens of experts from many fields at a single workshop. The report summarizes their combined efforts to frame the problem in a truly multi-disciplinary context. 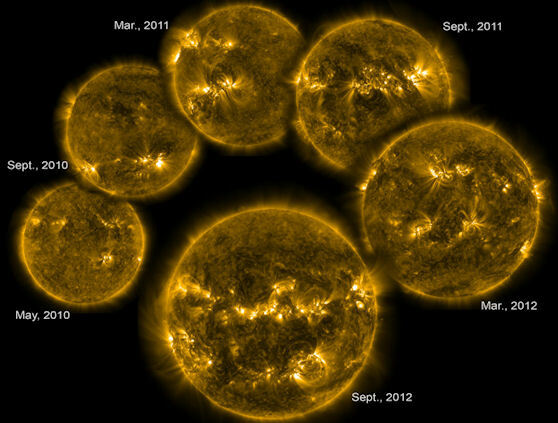 One of the participants, Greg Kopp of the Laboratory for Atmospheric and Space Physics at the University of Colorado, pointed out that while the variations in luminosity over the 11-year solar cycle amount to only a tenth of a percent of the sun's total output, such a small fraction is still important. "Even typical short term variations of 0.1% in incident irradiance exceed all other energy sources (such as natural radioactivity in Earth's core) combined," he says. Of particular importance is the sun's extreme ultraviolet (EUV) radiation, which peaks during the years around solar maximum. Within the relatively narrow band of EUV wavelengths, the sun’s output varies not by a minuscule 0.1%, but by whopping factors of 10 or more. This can strongly affect the chemistry and thermal structure of the upper atmosphere. Space-borne measurements of the total solar irradiance (TSI) show ~0.1 percent variations with solar activity on 11-year and shorter timescales. These data have been corrected for calibration offsets between the various instruments used to measure TSI. SOURCE: Courtesy of Greg Kopp, University of Colorado. Several researchers discussed how changes in the upper atmosphere can trickle down to Earth's surface. There are many "top-down" pathways for the sun's influence. For instance, Charles Jackman of the Goddard Space Flight Center described how nitrogen oxides (NOx) created by solar energetic particles and cosmic rays in the stratosphere could reduce ozone levels by a few percent. Because ozone absorbs UV radiation, less ozone means that more UV rays from the sun would reach Earth's surface. Isaac Held of NOAA took this one step further. He described how loss of ozone in the stratosphere could alter the dynamics of the atmosphere below it. "The cooling of the polar stratosphere associated with loss of ozone increases the horizontal temperature gradient near the tropopause,” he explains. “This alters the flux of angular momentum by mid-latitude eddies. [Angular momentum is important because] the angular momentum budget of the troposphere controls the surface westerlies." In other words, solar activity felt in the upper atmosphere can, through a complicated series of influences, push surface storm tracks off course. 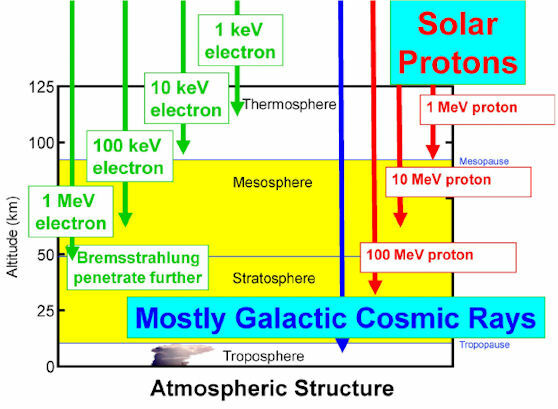 How incoming galactic cosmic rays and solar protons penetrate the atmosphere. SOURCE: C. Jackman, NASA Goddard Space Flight Center, “The Impact of Energetic Particle Precipitation on the Atmosphere,” presentation to the Workshop on the Effects of Solar Variability on Earth’s Climate, September 9, 2011. Many of the mechanisms proposed at the workshop had a Rube Goldberg-like quality. They relied on multi-step interactions between multiple layers of atmosphere and ocean, some relying on chemistry to get their work done, others leaning on thermodynamics or fluid physics. But just because something is complicated doesn't mean it's not real. Indeed, Gerald Meehl of the National Center for Atmospheric Research (NCAR) presented persuasive evidence that solar variability is leaving an imprint on climate, especially in the Pacific. According to the report, when researchers look at sea surface temperature data during sunspot peak years, the tropical Pacific shows a pronounced La Nina-like pattern, with a cooling of almost 1o C in the equatorial eastern Pacific. In addition, "there are signs of enhanced precipitation in the Pacific ITCZ (Inter-Tropical Convergence Zone ) and SPCZ (South Pacific Convergence Zone) as well as above-normal sea-level pressure in the mid-latitude North and South Pacific," correlated with peaks in the sunspot cycle. The solar cycle signals are so strong in the Pacific, that Meehl and colleagues have begun to wonder if something in the Pacific climate system is acting to amplify them. "One of the mysteries regarding Earth's climate system ... is how the relatively small fluctuations of the 11-year solar cycle can produce the magnitude of the observed climate signals in the tropical Pacific." Using supercomputer models of climate, they show that not only "top-down" but also "bottom-up" mechanisms involving atmosphere-ocean interactions are required to amplify solar forcing at the surface of the Pacific. Composite averages for December-January-February for peak solar years. SOURCE: G.A. Meehl, J.M. Arblaster, K. Matthes, F. Sassi, and H. van Loon, Amplifying the Pacific climate system response to a small 11 year solar cycle forcing, Science 325:1114-1118, 2009; reprinted with permission from AAAS. In recent years, researchers have considered the possibility that the sun plays a role in global warming. After all, the sun is the main source of heat for our planet. The NRC report suggests, however, that the influence of solar variability is more regional than global. The Pacific region is only one example. Caspar Amman of NCAR noted in the report that "When Earth's radiative balance is altered, as in the case of a change in solar cycle forcing, not all locations are affected equally. The equatorial central Pacific is generally cooler, the runoff from rivers in Peru is reduced, and drier conditions affect the western USA." Raymond Bradley of UMass, who has studied historical records of solar activity imprinted by radioisotopes in tree rings and ice cores, says that regional rainfall seems to be more affected than temperature. "If there is indeed a solar effect on climate, it is manifested by changes in general circulation rather than in a direct temperature signal." This fits in with the conclusion of the IPCC and previous NRC reports that solar variability is NOT the cause of global warming over the last 50 years. Much has been made of the probable connection between the Maunder Minimum, a 70-year deficit of sunspots in the late 17th-early 18th century, and the coldest part of the Little Ice Age, during which Europe and North America were subjected to bitterly cold winters. The mechanism for that regional cooling could have been a drop in the sun’s EUV output; this is, however, speculative. The yearly averaged sunspot number for a period of 400 years (1610-2010). SOURCE: Courtesy of NASA Marshall Space Flight Center. Dan Lubin of the Scripps Institution of Oceanography pointed out the value of looking at sun-like stars elsewhere in the Milky Way to determine the frequency of similar grand minima. “Early estimates of grand minimum frequency in solar-type stars ranged from 10% to 30%, implying the sun’s influence could be overpowering. More recent studies using data from Hipparcos (a European Space Agency astrometry satellite) and properly accounting for the metallicity of the stars, place the estimate in the range of less than 3%.” This is not a large number, but it is significant. This image of the Sun's upper photosphere shows bright and dark magnetic structures responsible for variations in TSI. SOURCE: Courtesy of P. Foukal, Heliophysics, Inc. In a concluding panel discussion, the researchers identified a number of possible next steps. Foremost among them was the deployment of a radiometric imager. Devices currently used to measure total solar irradiance (TSI) reduce the entire sun to a single number: the total luminosity summed over all latitudes, longitudes, and wavelengths. This integrated value becomes a solitary point in a time series tracking the sun’s output. In fact, as Peter Foukal of Heliophysics, Inc., pointed out, the situation is more complex. The sun is not a featureless ball of uniform luminosity. 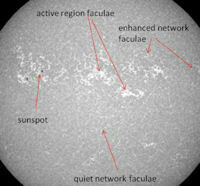 Instead, the solar disk is dotted by the dark cores of sunspots and splashed with bright magnetic froth known as faculae. Radiometric imaging would, essentially, map the surface of the sun and reveal the contributions of each to the sun’s luminosity. Of particular interest are the faculae. While dark sunspots tend to vanish during solar minima, the bright faculae do not. This may be why paleoclimate records of sun-sensitive isotopes C-14 and Be-10 show a faint 11-year cycle at work even during the Maunder Minimum. A radiometric imager, deployed on some future space observatory, would allow researchers to develop the understanding they need to project the sun-climate link into a future of prolonged spotlessness. Some attendees stressed the need to put sun-climate data in standard formats and make them widely available for multidisciplinary study. Because the mechanisms for the sun’s influence on climate are complicated, researchers from many fields will have to work together to successfully model them and compare competing results. Continued and improved collaboration between NASA, NOAA and the NSF are keys to this process. Hal Maring, a climate scientist at NASA headquarters who has studied the report, notes that “lots of interesting possibilities were suggested by the panelists. However, few, if any, have been quantified to the point that we can definitively assess their impact on climate.” Hardening the possibilities into concrete, physically-complete models is a key challenge for the researchers. Finally, many participants noted the difficulty in deciphering the sun-climate link from paleoclimate records such as tree rings and ice cores. Variations in Earth’s magnetic field and atmospheric circulation can affect the deposition of radioisotopes far more than actual solar activity. A better long-term record of the sun’s irradiance might be encoded in the rocks and sediments of the Moon or Mars. Studying other worlds might hold the key to our own. The full report, “The Effects of Solar Variability on Earth’s Climate,” is available from the National Academies Press at http://www.nap.edu/catalog.php?record_id=13519.